Living Tango presents TANGO EXPLOSION at the Hermosa Beach Pier on Friday, March 28 in conjunction with DANCE ANYWHERE®, a global event taking place at noon. 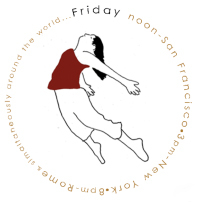 a global improvisational experience that places dance at the forefront of the world’s consciousness. Across the globe, the invitation is extended to join in this celebration of the freedom and expressions that dance can bring. To enjoy together the art form that permits the broader expansion of communication through a language of the body is something that not many get to enjoy.